Here we are at the start of a new year and as per usual I already have more planned than I can probably get through! Ah, but too many possibilities are far better in my book than not enough:) Time also for me to rub my hands together and plan up coming issues of the Pyro Newsletter and my web site...both of which I have large plans for. Planning and doing are two different things, but I'm determined to implement the majority of them, and that should be exciting. This issue's a real bitzer (bitzer, this, bitzer that) because I had a whole lot of little things to announce and show you, so I thought it best we get that sorted in the first issue of the year and then get into some more meaty stuff as we move along. So what can you expect from your free newsletter in the coming year? In the next issue I'll begin a series of interviews with some interesting and talented pyrographers from around the world. I'll be asking them each the same set questions so we can get an idea of how everyday pyrographers differ to each other. Amongst other subjects coming up, we'll be looking more closely at special techniques and various surfaces. I'd like to do this in a very visual way by pictorially walking you through some projects I'm working on. This will chew up a little bit of memory so the download will be slightly longer at times, but I'm a big believer that a picture paints a thousands words, so why should I bore you? The other subject I've been asked to continue is one that can be a bit of a yawn for some, but interesting for those who would like to try their hand at selling. I'll be continuing the series of 'When the Market Stalls' by looking more closely at the business of marketing your work. Oops! Sorry! (You nearly got away from me:) I just remembered one thing I would like to quickly cover before signing off. I subscribed to a 'free newsletter' a while ago, only to be told recently that the list had gotten so large and the time taken to produce it was so great that, with deep regret, I would now have to pay for any further issues. I well understand the business practice of building a large membership based on a good free service and then eventually cutting off that service unless payment is made. After all, even if 70% of the people bail, it still leaves 30% that are either willing to pay for it or can't be bothered unsubscribing from it. Naming no names, you know the type of thing I'm talking about. I was one of the unsubscribers, because even if I understand the practice, it doesn't mean I like it. But it got me thinking to let you know that nothing like that will ever happen here. The Pyro Newsletter will always remain free. Righto, let's get cracking. Here's hoping you enjoy this edition. It looks like I'll be heading up to the Great White North again this coming September...Kitchener, Ontario to be exact. I've accepted an offer to attend a huge wood carving seminar being presented by CHIPPING AWAY incorporated. The seminar will host 16 world class carvers, wood working experts and yours truly. We'll be presenting 68 seminars over a 3 day period as well as doing a whole lot of demonstrating. I'll be at the Chipping Away Resource Centre during my time away from the seminar to show my work, discuss burning and doing some hands on demos. More details to follow. There will also be a huge carving competition for beginners and intermediates, and yes, that includes PYROGRAPHY! This is a good chance to compete and not feel intimidated because none of the big guns will be allowed to enter. Please click here for more detailed information on the Chipping Away, International Carvers Conference. After the seminar I'll be doing some teaching at the Chipping Away Resource Centre. This is located in Kitchener, Ontario, Canada...not too far from Toronto. I'll be doing evening and day classes in both wood and leather...beginner and more advanced. More details, times, dates, class subjects, where to book etc, will follow in a later edition of the Pyro Newsletter. Some of my work can now be found at NATURAL SELECTION, in the heart of Sydney. Natural Selection is located in the Metcalfe Arcade, 80 George Street, Sydney...which is in the historic 'Rocks' precinct, close by the Harbour Bridge and Circular Quay. Their phone number is: 02 9247 9174. Email propietors Michael or Aviva and they will help you out. I find it a challenge to try something new and commissioned pieces of a personal nature sure provide that challenge. I'm not talking about the type of commission that comes from someone requesting a subject without anything specific in mind, more so I'm talking about doing work from a photo or something commemorating a moment. This type of project takes more thought and care because you know the subject means something very personal to the client and that they usually now that subject intimately. 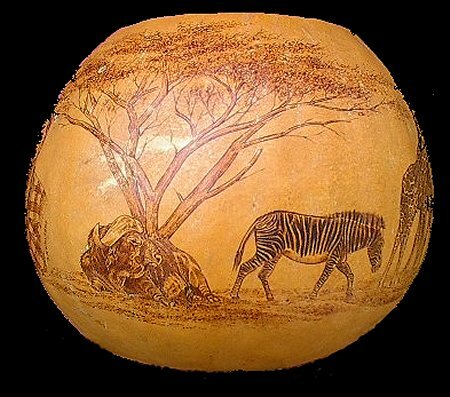 I was given a more unusual challenge by a client recently who wanted his honeymoon to Africa commemorated in pyrography. I thought I would share the process with you. 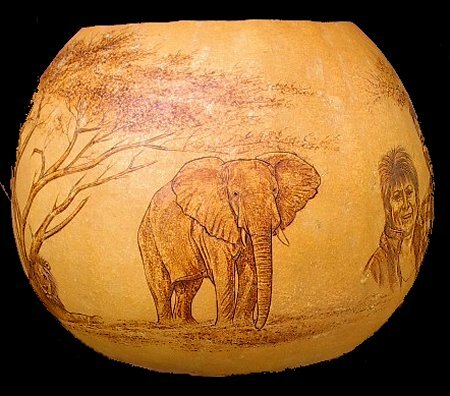 1) The client wanted the work done on a gourd because he had seen them in Africa but couldn't bring one back into Australia because of our strict quarantine restrictions. 2) He wanted an African animal or animals on it, preferably from his own photos. 3) If possible, he wanted a picture of him and his new wife on it. The rest was up to me. There were several things I had to consider and decide. 1) Even though the photographs were clear and plentiful, were they going to be big enough for me to work up into a much bigger picture? 2) Should I use more than one animal? 4) Should I try and sort all of this into some sort of theme? 5) Should I use any colour? 6)How should I arrange the subjects? 1) It was going to be a struggle to use the small pictures and I probably wouldn't have considered it before the advent of computers, but I decided that scanning and enlarging would help decipher the photographs where needed. This may seem a touch like cheating to some but I wanted the animals to be as accurate to the clients own photos as possible and with that in mind I'll use what ever may be available to me. Plus the client owned the images so Copyright infringement wasn't an issue. 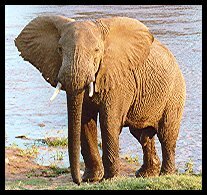 2) While I talked to the client about his trip I took note of what animals and images meant the most to him. Those images will often be the ones that have the best memories attached to them. I decided to use all of those animals where possible. 3) Even though this part made me the most nervous of all, I decided to try do a portrait of the couple by using just the head and shoulders taken from a full body photograph...a tiny, tiny full body photograph. I thought it was important to give this a shot because of what it was commemorating. 4) Yes, I wanted a theme. Something to joint it together...to marry the images together. One or two big animals alone would have been fine, but several had to have something to tie them together. Those flat Acacia trees (so common in African image) were in many photos. 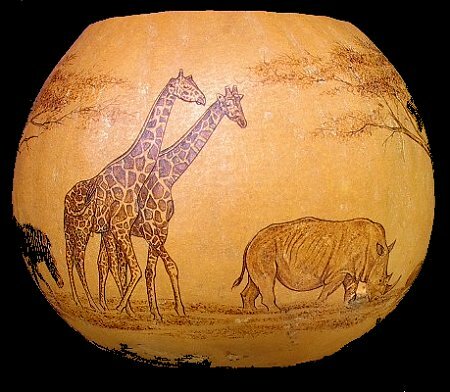 I decided to use two large trees on opposite sides of the gourd to encircle the top and to situate the animals under. 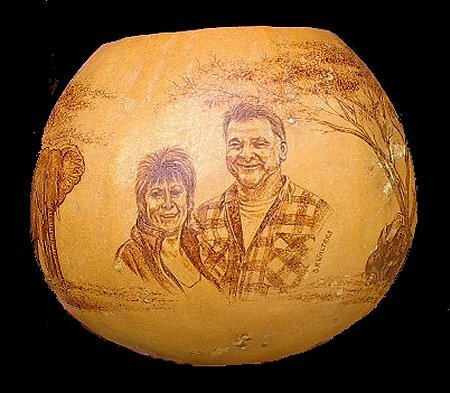 5) In keeping with the natural feel of the gourd and subject matter I decided not to use any colour at all. 6) Deciding how to arrange the subjects was a difficult decision, but after I chose all of the animals I noticed all of them but one pointed the same way. Normally I wouldn't like everything to be so orderly, but I did want to keep the work on the animals as close to those taken. I decided to turn the Elephant around and point everything one way. I had it in my head that it would look like a procession, symbolic in a way of the journey they took. LOL...yeah, I know, I know. That sounds just a bit too blasted artsy for my liking! 7) One thing I did want to keep in mind for this piece was not to get lost in too much detail. There was a lot of animals to do and being too fixated on my behind wasn't going to get the job done in time. 1) Choose and prepare the gourd by cleaning, sanding the inside and painting that black. 2) Choose the photos, scan them, re-size in relation to each other. 3) Sketch in the trees and start the long job of creating the canopy. 4) Finish the canopy and plot the animals and the happy couple. 5) Outline the animals and start to fill in the tone by using photos and scans. 6) Fill in the ground. 7) Fearing heart failure and having nothing else left to burn, I finally decided to then burn the happy couple. 9) Thankfully, the portrait turned out okay and I sealed it all with several coats of satin acrylic spray varnish. Gourds are fun to burn and look really terrific but they can be waxy/hard to burn on compared to most wood. It is possible to have the nib slip if you're not careful. A Skew nib is excellent on gourds to prevent slipping and produce a clean line. Gourd surfaces can be bumpy compared to wood, making subtle/smooth shading more difficult in some cases. This creates a slightly more rustic effect that is very appealing and natural. The tree canopy was done by stippling and squiggling with a writing nib. Nibs get more dirty burning on gourds than most wood...don't forget to keep them constantly clean by flicking the muck off. It makes for a much neater and easier burn. To save your sanity, make sure you burn what you are unsure of first and not last. Did I mention that already? Because of the curved shape, I find using spray varnish is much more effective than brush on varnish. Size of the gourd: basketball size. Do a search for 'gourds' on a search engine and be prepared to be shocked at the numbers! I had put this newsletter to bed and was just now in the process of posting when I got this really fun and innovative invitation in the mail. What a great way to invite and advertise a special event!! It certainly got my attention much better than a letter. (I wonder what my postie thought?) Such initiative deserves reward, so I've opened up the newsletter to insert a little blurb about the festival. 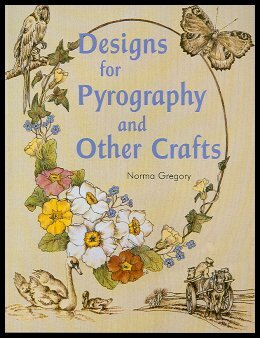 The name Cheryl Dow is already well known to many pyrographers world wide...especially in North America. For those who don't know of Cheryl, she's simply a legend of pyrography. It's hard to think of anyone I know in pyrography who has a higher profile or anyone who loves teaching more than her. Apart from her well known series of woodburning instruction books, Cheryl passes on her extensive knowledge and skill by teaching in person and by writing for Chip Chats Magazine. (The American National Wood Carvers Magazine). North Americans interesting in Cheryl's books or classes can contact her via her web site at:www.cherylddow.com/. 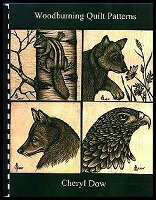 WOODBURNING I - Tips to good successful burning - Advice on how to pyrograph trees, grass, bushes, animal hair, eyes, - 14 patterns, tracing pattern, instructional pattern and finished picture and how to approach burning each one. Raccoon, wolf, squirrel, owl, barn scene, lighthouse, fox and barn, merganser, pintail duck, chickadee, butterfly, fawn, moose, wolf head. WOODBURNING II - Same as number one, plus calligraphy advice. 11 larger and more challenging patterns with more description and advice. Loon, mouse, raccoons, lynx, chipmunk, frog, barn, heron, deer, wolf. 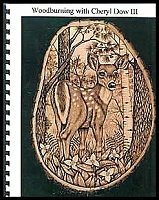 WOODBURNING III - Same general instruction as first two books as well as calligraphy instruction and the basic instruction to burn waves, flowers, pine needles, mountains etc. No individual instruction for each pattern so this is for the burner with some experience or to use the patterns in a line burning manner. Tracing pattern, directional pattern and finished picture to guide you. Too many patterns to name. 11 large and 35 small ones. WOODBURNING QUILT PATTERNS - Like number 3 but this time there are 48 small patterns than can be used as is or re-sized. Tracing pattern and finished picture to guide you. 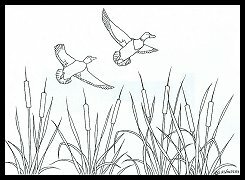 *A FREE PATTERN called 'Mallards in Flight' is ready for downloading on the PATTERNS PAGE. 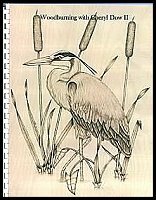 *Mallards in Flight is available as a pyrographic tutorial in the Feb 2004 edition of The Australian Woodworker, sold throughout Australia and New Zealand. Your free full sized pattern can be downloaded from the PATTERNS PAGE. To fix mistakes burners often resort to sanding paper. I prefer to use the bottom side of a snap blade. Some of you might know this as an Exacto knife. It's the kind you can snap the end off when it gets dull to expose the sharp new portion. I use the bottom edge of this as a miniature sanding scraper. (I don't find it necessary to use a handle, I just hold the blade, but take care if you also want to do this.) The reason for this is two fold. 1) I can get a much higher degree of control over this than sand paper, allowing me to remove mistakes in detail and in tight places. 2) To my fussy eye, sand papering changes the tone and feeling of the wood in the area sanded compared to the surrounding worked and seasoned surface. It gives it a chalky/dull appearance that does not marry well with the rest. On finishing, this area can also stand out quite badly. A carpenter or wood worker will tell you that a wood scraper will 'sand' the surface as well, if not better than sand paper. It also does it in a flat controlled manner, not forming a trough like sanding paper can. A snap blade is also excellent to pick out the whites of eyes, highlight an area or to scrape your nib clean. Heck..it will even sharpen your pencils! I Always have one sitting next to whatever I'm working on.